The week of September 16-22 is National Farm Safety and Health Week. While there is a massive effort to prevent these accidents from happening which ranges from county extension workshops, panel discussions from farm groups, and a focus on educating youth who work or visit farms; farm accidents still exist. Twenty years ago, my father who was a farmer had a battle with a grain auger and lost four of his fingers on his right hand. It seemed that most of our neighbors also had been in minimal or severe farm accidents. According to the Bureau of Labor Statistics, there were 270 fatalities of farmers/ranchers/agricultural managers in 2014, ranking it in the top 10 most dangerous jobs. Recently I had a client who was looking for a mechanism that would allow him to use a hand clutch on an older tractor because of a leg amputation. At the same time I was looking for possible solutions, I was also researching the AgrAbility program. The mission of the AgrAbility program is “to enhance quality of life for farmers, ranchers, and other agricultural workers with disabilities, so that they, their families, and their communities continue to succeed in rural America.” It is a federally funded program which has 20 state/regional programs, and six state affiliate programs; you can check out success stories on Facebook at https://www.facebook.com/nationalagrability/ . There is currently not a program in our state, but I discovered a part of the program that could help my client. The National AgrAbility program has a Toolbox (Assistive Technology Database) where people can go to find solutions to their assistive technology needs. You don’t have to be a farmer or rancher to use the database. It may be that someone with low vision is looking for a stud finder for household projects, or someone without arm strength who still wants to fish and needs an adapted reel, or someone with a back problem who needs a rear vision system for backing up. Check out the Toolbox at http://www.agrability.org/toolbox/. It is an amazing resource with easy search capabilities. My dad, like so many other farmers, made do with what he had after his accident. He was harvesting just a week after the accident with a bandaged hand, using twine connected to the hand controls. I wish I would have had the AgrAbility Toolbox database to help him. But I was able to assist my client find a possible modification to his challenge. He was happy to learn that there is a dual hand clutch mechanism developed by an Iowa farmer for an older tractor that may work for him. 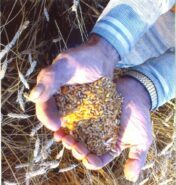 My dad holding grain in his hands.